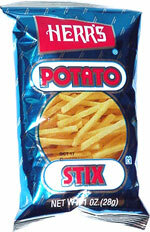 Taste test: These are good regular potato stix without too much salt. They taste potatoey and good. They leave quite a bit of oil on your fingers, so I would not recommend eating this without a good absorbant napkin handy. Unlike many potato sticks, such as French's, these come in a small bag, rather than a can, but that didn't detract from the freshness or flavor. Smell test: Normal aroma of potato sticks. From the package: “Make Herr's Yours®” ... “Ingredients: Potatoes, Hydrogenated Cottonseed Oil, and Salt. 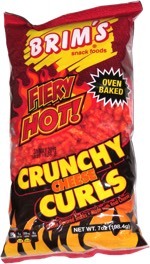 This snack was discovered by Jeremy in Baltimore. Review published .